Lee Miller’s career was by any standards extraordinary. But it was also beset by contradictions – one of the most fundamental being that the Second World War, though it gave her the opportunity to become a supremely talented and courageous war correspondent and photojournalist, left her emotionally and physically exhausted, never again to produce such exceptional work. 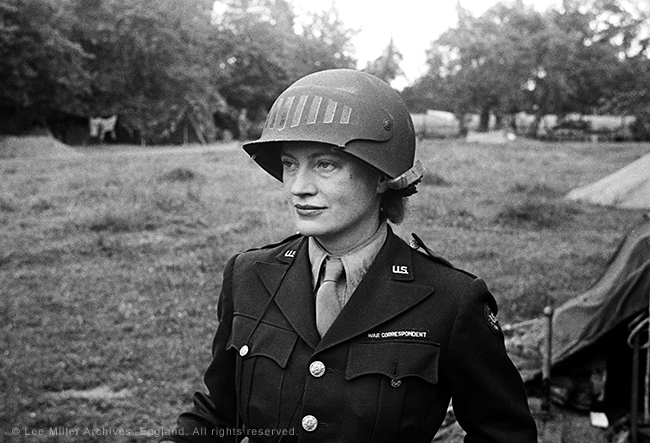 (‘Lee Miller in steel helmet specially designed for using a camera, Normandy, France’, 1944, by unknown photographer, above). 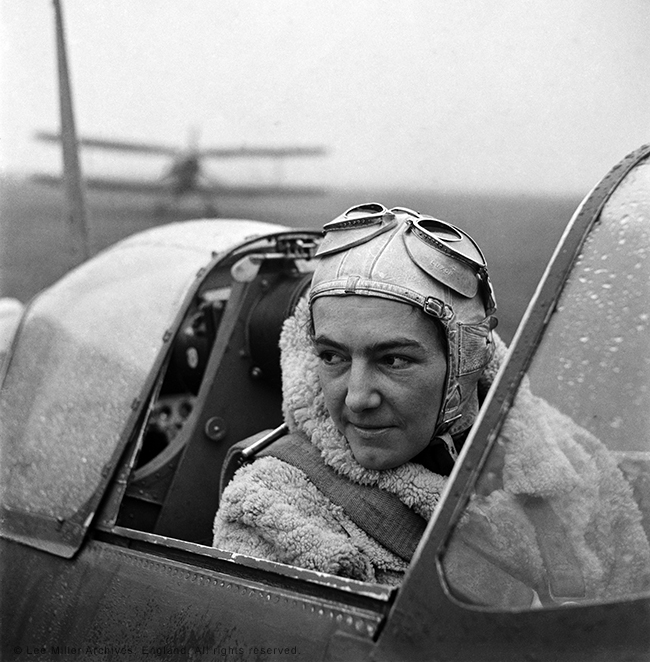 The Imperial War Museum’s exhibition focuses on Miller’s photography during the war years, using it in a documentary fashion to tell the story of women’s participation in the war effort – through the eyes of a woman who herself played a crucial role. This makes the show a fascinating combination of objective historical narrative and deeply personal biography; the walls of black and white photographs depicting land girls, nurses and female auxiliaries (‘Anna Laska, Air Transport Auxiliary, Polish Pilot flying a Spitfire, White Waltham, Berkshire’, 1942, above left) are broken up by display cases containing Miller’s service uniform, telegrams and letters to her future husband Roland Penrose or to her editor at Vogue, and items she took from Hitler’s apartment when she found herself there on assignment immediately after his suicide. There is also the chance to watch British Pathe clips of Miller at work after she returned from these assignments and published her book ‘Wrens in Camera’ (1945), giving a brief sense of the living woman behind the camera. Lee Miller began her career as a model before learning the techniques of photography from avant-garde artist Man Ray in Paris in the 1920s, and becoming closely associated with the Surrealists. 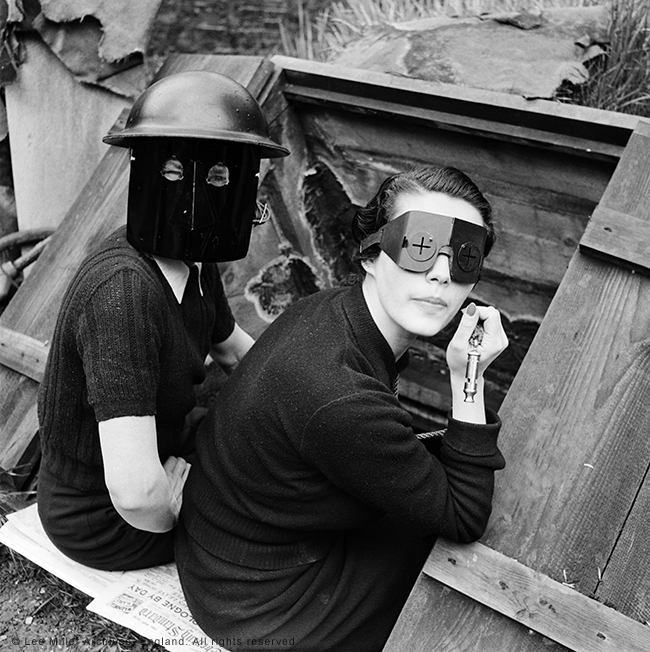 However, the exhibition really begins with Miller being commissioned as official war photographer for Vogue in 1939; during the early years of the war fashion shoots overlapped with documentary journalism, as Miller produced images of a model in a chic tweed suit posing among bomb-damaged houses, models sporting fire masks (‘Fire Masks, Downshire Hill, London’, 1941, above right), and the Vogue editorial staff displaced to a basement beneath Bond Street. Then there are beautifully composed pictures of Wrens, land girls, territorial or air force auxiliaries and US nurses going about their daily tasks; as a woman in uniform Miller had unprecedented access to – and empathy with – her subjects, picking up on the small poignant details of clothes drying in the window or a child’s photo propped on the mantelpiece. 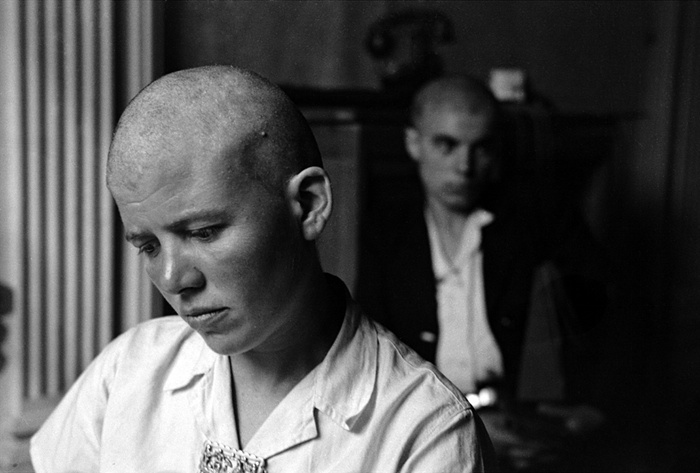 This empathy comes to the fore once again in the photographs Miller took in Europe immediately after the war ended: shaven-headed French women (‘Woman accused of collaborating with the Germans, Rennes, France’, 1944, above left), German women filling in trenches outside Cologne, starving Viennese children tended by nuns. Even amid the rhetoric of victory her images underline the moral confusion of the post-war period, the trauma and displacement of families and communities, conveying a sense of universal suffering, mixed with relief and uncertainty. 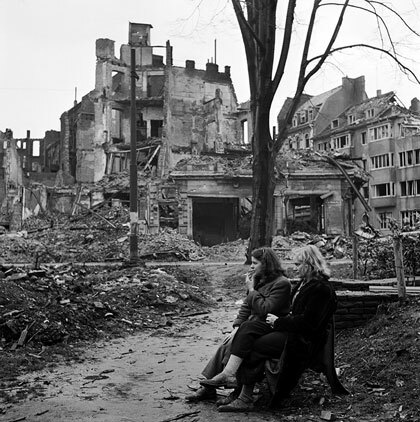 (‘Two German women sitting on a park bench surrounded by destroyed buildings, Cologne, Germany’, 1945, below right). Some of the final photographs are haunting in their prescience. They capture an atmosphere of heavy foreboding, a brief hiatus between war and the harsh Communist regime that was about to descend upon eastern Europe – the two upper class women gossiping beneath a huge image of Stalin in east Berlin, the Romanian queen standing small and fragile in her empty palace, a Hungarian countess with a bag of groceries on the street. But for Lee Miller, the end of the war saw the end of her career as a photojournalist (though she produced several more books from her home at Farley Farm in Sussex); the impact of her war experiences led to bouts of depression and the full extent of her creative output was only discovered by her son Antony after her death. Seventy years later, this is a fitting tribute to her achievements. Images: © Lee Miller Archives, England 2015 and The Penrose Collection, England 2015. All rights reserved.